I'm home! I have lots to share so I'll be doing a few posts about Quilt Market. 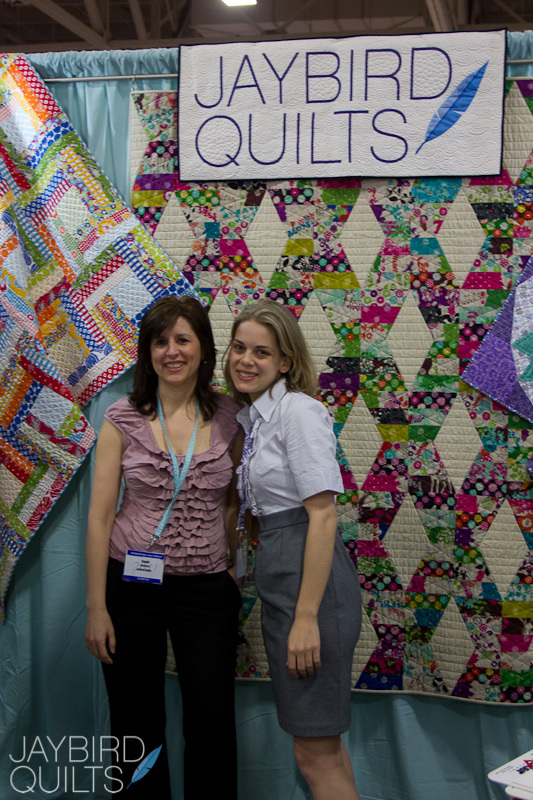 This post is about the people of Quilt Market. I didn't take nearly as many photos as I thought I did.. but here are some from my camera! With Candi in my booth. 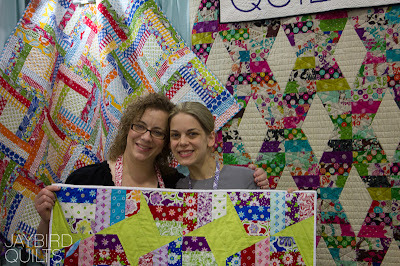 Behind us is Hugs & Kisses made with Echino & Essex Linen and it was the star of the show. Alissa & Kristen the authors of Block Party! More photos & stories to come!! A big thank you to Rachel for blogging for me & keeping everyone in the loop via twitter/facebook/flickr while I was gone! SO glad you had such a great time. Your booth is awesome! You should be very proud of all you accomplished in the past few months. SO??? Are you going to relax for a few days or are you onto the next design already? You look like you've had a lot of fun and all your quilts look beautiful hanging up. looks like FUN ! your quilts look wonderful ; I was thinking of doing hugs and kisses with black instead of white ; so now I see how it would look !!!! Now my mind is made up ! Looks like you had a great time! do your cheeks hurt from smiling all weekend!? Hope you got tons of orders too! 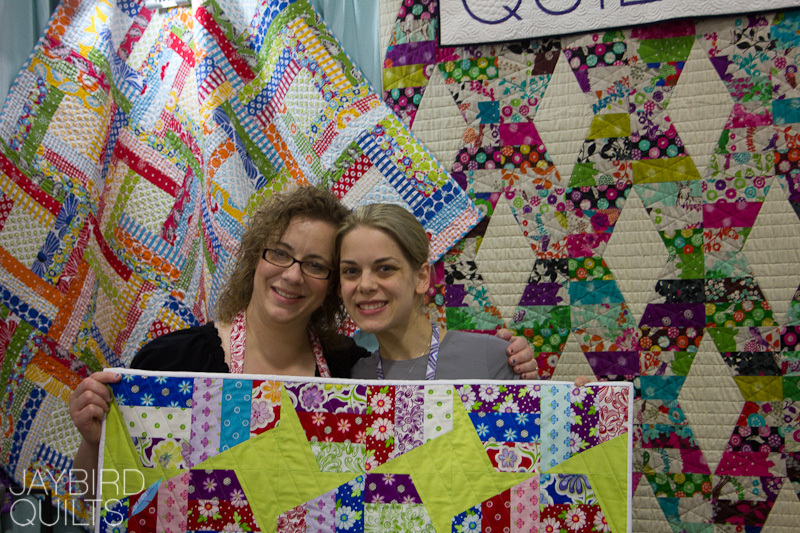 Quilt market looks like so much fun! Your quilts are fantastic! I just started my very first quilt ever this week for a friend. She has asked me to recreate a baby quilt for her husband who is in the military and due home soon. I'm nervous and excited to be making for her all at the same time! I love that Hugs & Kisses pattern and everything else you've shared. WOW! Lots and Lots of eye candy, that's for sure. 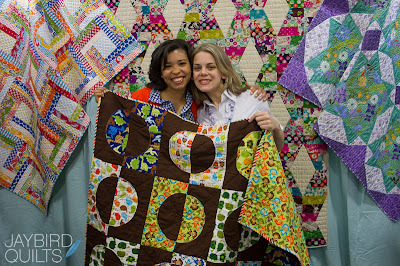 Spring Quilt Market + lots of fun with lots of fun people! 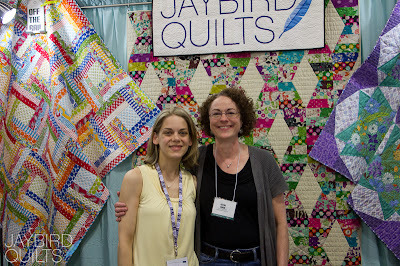 Oh, and lots of fun Jaybird Quilts. Hello! We LOVED meeting you at Market! My friend and I are the ones who shared a table with you during the Fons & Porter party! I was sooo excited when I bumped into you and read your logo on your bag!!! TOO FUN! 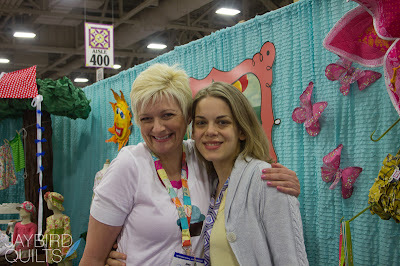 You are as cute and friendly in person as you are here on your blog! Soo glad we got to meet up! 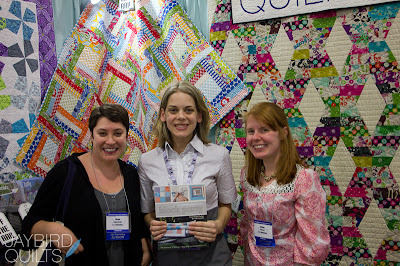 Thanks for sharing, love seeing the booths and the people behind the blogs. 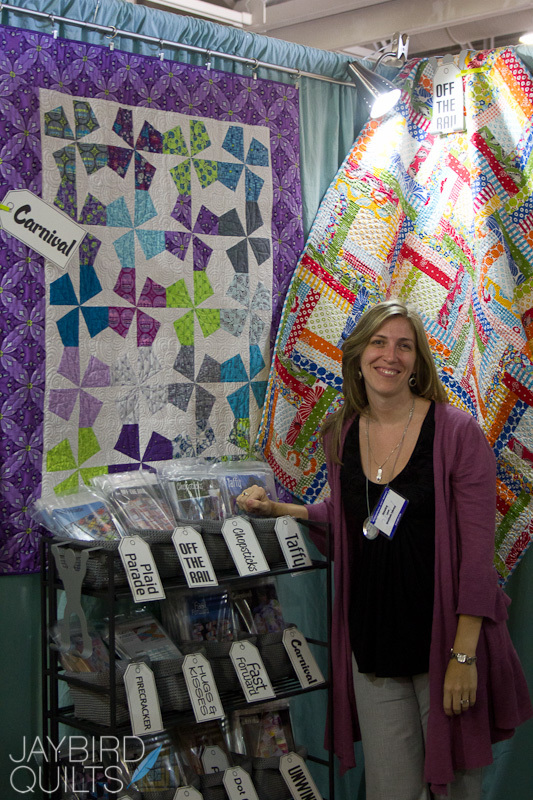 Hi Julie, LOVE LOVE LOVE,how much bright colour there is in your booth,especially PURPLE. Love your work and style. 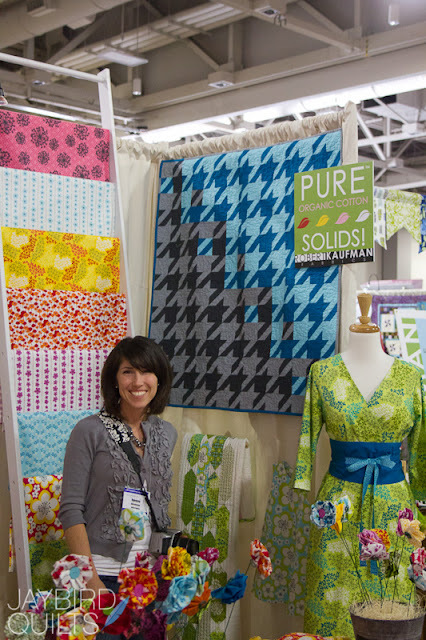 Its so fun to see you hanging with many of your friends and rocking the show with the fabulous quilts! The colors are wonderful and the designs fabulous. Hope you came home with lots of orders and ideas! so fun to be reading about and seeing pictures of market. 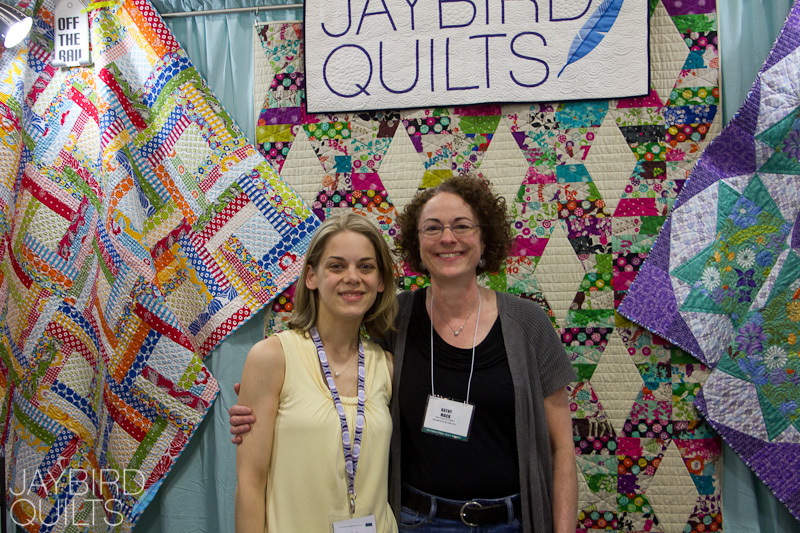 Lots of cool Jaybird quilts there! I love your patterns and it was fun to see them in so many different fabrics. Great eye candy. Color me jealous, I do want to go so bad! But I love hearing about it too! 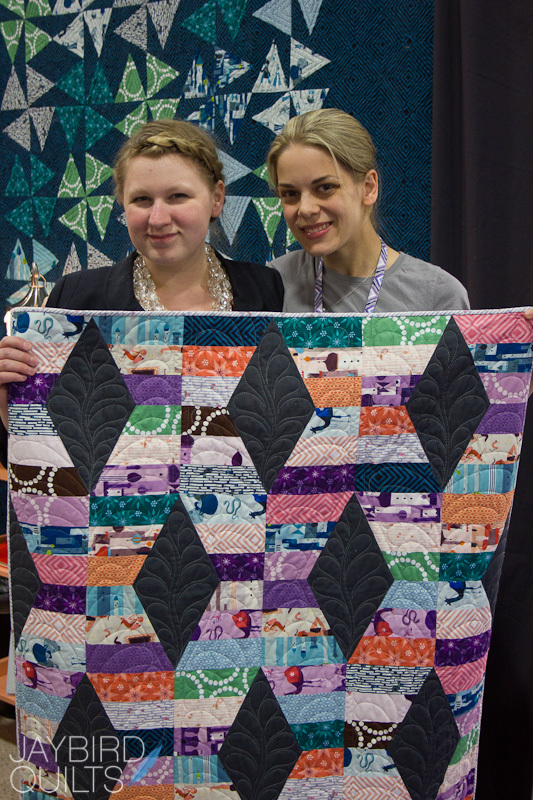 I LOVE your Off the Rail quilt!